You probably know your state's Senators. You may even know your district's Representative. But do you know their "reported bills average"? How about what schools each one attended, or how many bills they've co-sponsored in this, the first session of the 110th Congress? Unless your idea of a fun night involves a bottle of wine, a cozy fire and C-SPANs 1 through 3, you're far more apt to know Hayden Panettiere's birthday (8/21/89) or Tom Brady's quarterback rating (137.9 seven weeks into the '07 season) than Hillary Clinton's Congressional attendance record (84.1 percent). And really, why should you? In an era of sound bites and single-issue voting, there's not much incentive to be an informed citizen anymore, and even if there were, you'd need a Poli-sci degree to grasp the day-to-day events. Unless you play Fantasy Congress. Andrew Lee says he came up with Fantasy Congress in college, after watching his roommate obsess over fantasy football, and he frames his description of Fantasy Congress in fantasy sports terms. "Think of Fantasy Congress just like fantasy football," he says, "but instead of being a general manager of a football team, here you are the guy in the background who's picking and choosing the members of Congress that you think are gonna do well when they reconvene. Say, for example, you choose a number of members of Congress. ... It's exactly [like] fantasy football, except the metrics aren't touchdowns and interceptions." Fantasy sports make use of preexisting statistics to determine how good a player is. Politics don't score that way, so Lee's team had to figure that out as they went along. "When we first started, we [used] legislation," he says. "Our users told us legislation is really boring. I can't tell when a piece of legislation is gonna be passed, but I can tell you, however, I can see when I read a piece of news - say, for example, right now with Senator Larry Craig from Idaho. He's in some trouble in terms of his bathroom incident. His scandal that's going on, I can see that. I'd like to be able to score points ... based off that. So we created a category for news mention. And in addition to that, you can actually see votes as they occur on C-SPAN. So people were interested in seeing votes." Beyond that three-stat core, fantasy leagues can track how many bills a Congressperson co-sponsors, how often he deviates from his party line and his attendance record, and the team applies a set amount of points for each stat. 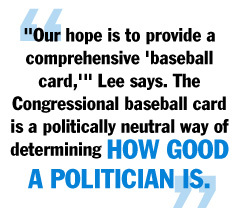 "Our hope is to provide a comprehensive 'baseball card,'" Lee says. The Congressional baseball card is a politically neutral way of determining how good a politician is. "What's the way that we know a member of Congress is actually doing their job? If they sponsor their own legislation, they probably wanna see it pass. How far did they push that legislation? When they vote against their party, that's a big deal - it's a pretty brave thing to do - so ... we give them more points. And then ... members of Congress love getting in the news, and being a good member of Congress means getting in the local news and getting in the national news. Sometimes that's not a good thing for some people, like Larry Craig. But we're working on the scoring metrics."